There are a lot of iPhone/iPad examples out there, but surprisingly I haven’t seen one for a common task – using a table view to create a form. Here’s the source code. In this example, we’ll create a form with 2 fields and a button. When the user clicks Done, an alert appears. 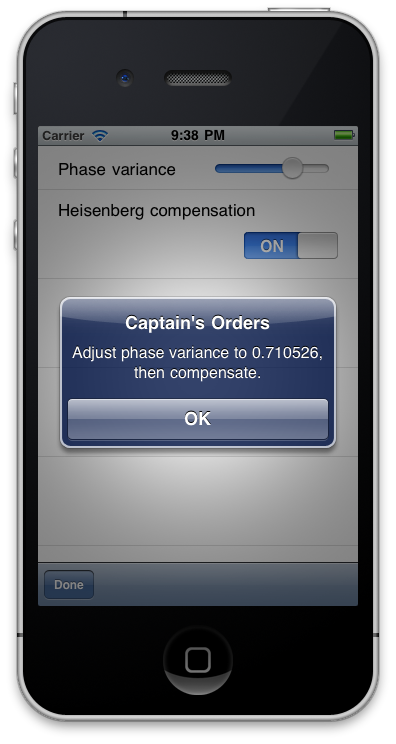 UI element placement and sizing (in the xib) is separated from logic (in the view controller class). All UI elements in the form are contained in one xib. Table view cells can be conditionally included or excluded from the table in -viewDidLoad. The table easily accommodates a mixture of xib-defined cells and cells created at runtime. Table view cells can have different sizes. 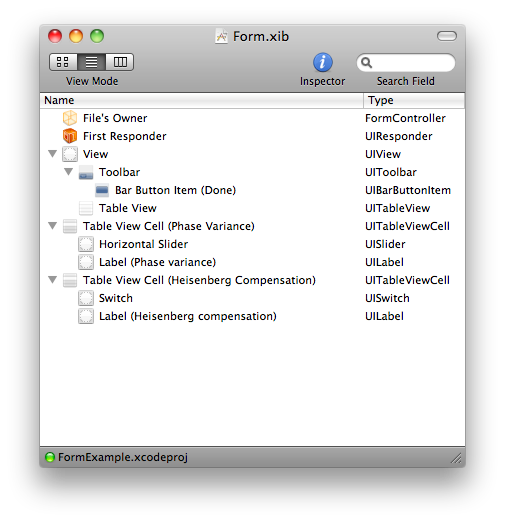 Create a subclass of UIViewController called FormController. Create a View xib called Form.xib. Set File’s Owner to FormController. Drop a Table View inside the View. Drop Table View Cells into the xib, but not inside the View. Add the controls you want to each Table View Cell. If needed, increase the height of the Table View Cell to fit. 1. Add an IBOutlet for each UITableViewCell. 2. Add an IBOutlet for each control to be accessed in the code. 5. 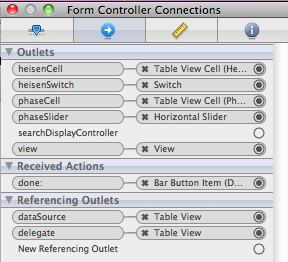 Make FormController a UITableViewDataSource and implement the protocol methods by referring to the cells array. 6. If any of the table view cells are taller than the default height, make FormController a UITableViewDelegate and implement heightForRowAtIndexPath by referring to the cells array. 7. Add an IBAction method to process the form in response to the ‘Done’ button. UIAlertView *alert = [[UIAlertView alloc] initWithTitle:@"Captain's Orders"
Connect up the IBOutlets and IBActions between File’s Owner and the Table View Cells and controls. Connect the Table View’s dataSource and delegate outlets to File’s Owner.